AMERICAN FORK – One thing that seems certain as Utah’s high school baseball teams begin to play region games is that Pleasant Grove is a team to be reckoned with in Class 5A once again. A major reason for that is the Vikings ability to score runs, and that means they are never out of a game. A year ago, Pleasant Grove lost its first playoff game before winning its way all the way to the state title game against Jordan. During that incredible run of seven straight win-or-go-home wins, the Vikings posted double-digit runs four times and leaned heavily on the pitching and the bat of eventual 5A MVP Easton Walker. Walker was on the bump for Tuesday’s Region 4 opener at American Fork, but it was not your typical Easton Walker pitching performance. 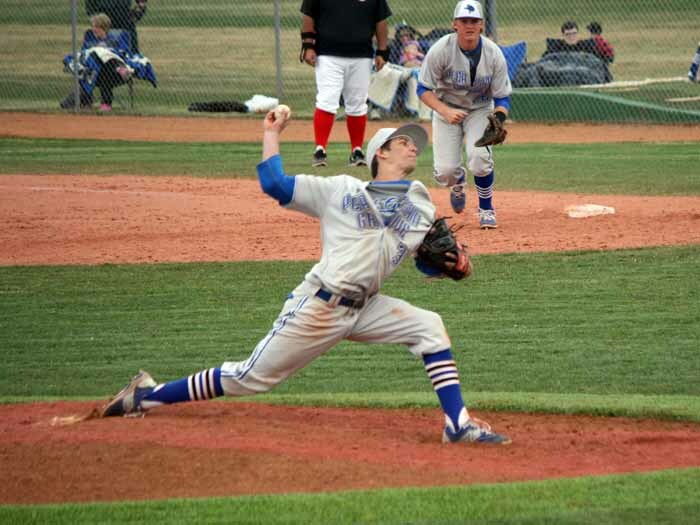 The Cavemen were dialed in on pretty much everything the right-hander delivered and by the time he came off the mound in the fourth, Pleasant Grove was down by eight runs, 11-3. For the day at least, it was his teammates’ turn to have Walker’s back, and they did so, in dramatic fashion, using a six-run sixth and one more tally in the seventh to claim a 12-11 victory and remain unbeaten for the season. American Fork scored the game’s initial run in the opening stanza on an errant pick-off attempt and then added four more in the home half of the second. Mick Madsen and Dallin Searle had run-scoring singles and Hagen Holmstead drove in two more in that inning, which had the potential to be even bigger. Walker escaped a bases loaded, one-out situation on a come-backer that turned into a pitcher-to-catcher-to-first base double play. The Vikings appeared to find their footing after that, and they loaded the bags before anyone was out in the top of the third. That set things up for Payton Henry, who banged a two-run single that got his team on the board. 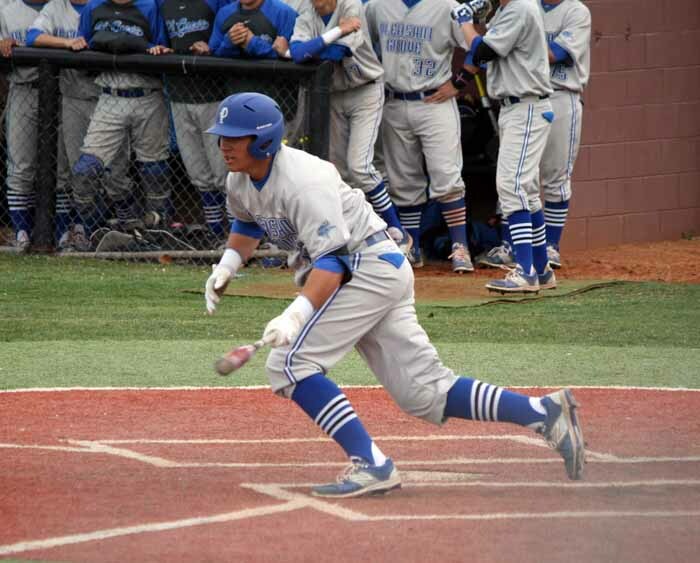 Pleasant Grove added another run on a Chase Merrell grounder to get within two runs. It was only a temporary reprieve, however, as the Cavemen remained extremely comfortable in the batter’s box when they took over on offense in their half of the third. A Turner Knight lead-off home run tacked on one more run, and then Kody Hall hit a sacrifice fly to get the advantage back to four at 7-3. It appeared that American Fork broke the will of the Vikings in the bottom half of the fourth when it tacked on four more runs to get the margin to eight. Catcher Tyler Gardner led off the inning with a triple and then Jake Norton took advantage of the drawn-in infield, pushing a ball up the middle to plate the run. Hayden Wood drove in a run with a base hit, and then Hall pounded in what appeared to be the final nail with a two-run knock down the left-field line that stretched the lead to 11-3. That hit came against Ben Eldredge, who came on in relief for the Vikings just before the Hall at-bat. 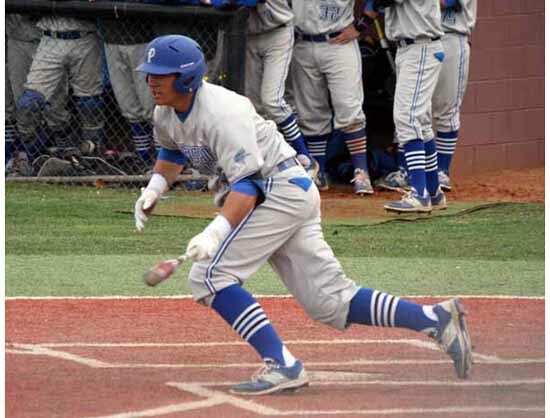 It was in the fifth that momentum made its move to the first-base dugout and the visiting Vikings took advantage of a number of game-changing opportunities. Eldredge led off the fifth with a double and then scored when Henry’s single to center kicked off the glove of the American Fork outfielder. A Tate Briggs sacrifice fly scored Coleman Edwards, who was running for Henry. The Cavemen tried to re-ignite the scoring in the home half of the fifth, but when Gardner tried to take second base on a flare the fell just inside the line behind first base, he was gunned down for the second out of the stanza. That play helped the Vikings stay in “striking distance,” down by six heading to the sixth. Eldredge singled in the first run of the sixth, and then Pleasant Grove scored a second run when Matthew Wilde’s ground ball got through the American Fork second baseman for an error on what would have been the second out. After a hit batter loaded the bags, Zack Peterson unloaded them with a three-run double that pulled the Vikings within one run. After a groundout got the Cavemen one out away from escaping with even that small advantage still intact, Pleasant Grove manager Darrin Henry turned to his bench and called on pinch hitter Logan Carlson. The senior delivered with a base hit to left field that chased home Peterson to tie the contest at 11-11. After Eldredge set down American Fork in order in the sixth, he singled in the top half of the seventh, putting himself in position to score the eventual game-winner. With the game on the line, the Vikings found the final answers with junior Payton Henry, who doubled to right to score Eldredge with the go-ahead run, and then took the mound to close out the game with his signature heater. Henry set the Cavemen down in order to close out the game and finish off an improbable come-from-behind win. The two teams meet two more times this week to close out the three-game set as Pleasant Grove (1-0 in Region 4, 6-0 overall) will host the Cavemen (0-1, 6-2) Wednesday before the two squads return to American Fork Friday.